The Transatlantic Trade and Investment Partnership (TTIP) should be a “mixed” agreement and, therefore, be ratified by national institutions, according to Greece’s economy minister. EURACTIV Greece reports. 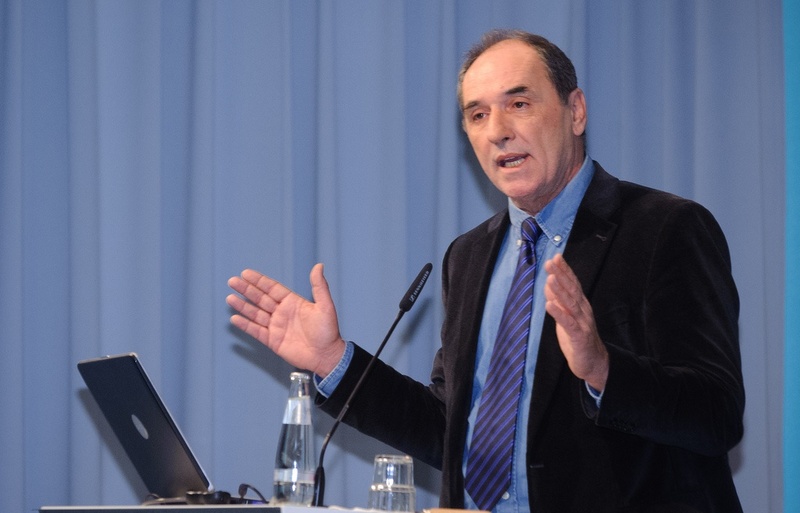 Speaking at a conference on Wednesday (13 January) co-organized by VouliWatch and The Press Project, Greek Minister of Economy, Infrastructure, Shipping and Tourism, Giorgos Stathakis, explained his government’s position on TTIP. Before being in government in January 2015, the leftist Syriza party had been suspicious of TTIP. But in August 2015, the Syriza party was split, as far-left rebels who opposed Prime Minister Alexis Tsipras’s bailout deal with Europe decided to form a new movement. Since then, the Syriza-led government has adopted a more moderate tone on the TTIP agreement. Stathakis noted that at the beginning, the trade agreement “was unimaginable, not transparent and inaccessible”. He added that there was also the “shock” idea, according to which the deal should be sealed in record time “before any discussion took place”. But the framework of TTIP negotiations has changed. He said that now, the negotiations are more accessible. “The right of states to legislate and to change the law for the protection of public health, safety or the environment, and consumer protection, is ensured,” Stathakis underlined. The Greek minister also stressed that the investor-state dispute settlement mechanism (ISDS), which has triggered strong reactions across Europe, was replaced by a normal court of international authority, with “permanent features and function codes”. Stathakis said, though, that the pending issue was whether this agreement is the exclusive right of the European institutions to co-decide, or it should be a mixed agreement, which requires ratification by national institutions, meaning a national parliament vote, or referendum. “It is a demand of several countries that, according to the Lisbon Treaty [Article 207], it should be considered a mixed agreement,” the Greek official stressed. In a recent interview with Tagesspiegel, media partner of EURACTIV in Germany, the EU’s Trade Commissioner Cecilia Malmström said that a mixed agreement would most possibly be the case. “It will probably be a mixed agreement, especially if it is as comprehensive and ambitious as we want it to be. Then 42 parliaments, 6 in Belgium alone, would have to vote on TTIP. But the European Commission cannot release its legal assessment until the agreement is finished,” she underlined. VouliWatch: ????????? ??????? ??? ??????????? ??? ??? TTIP – ??????????? ???????? ????? ???????? ??? ?????????? The Press Project: ???????? ??????????? ????????? Why is then there an European Parliament ? Isn’t TTIP an European and American matter ? Maybe Greece should retake the Drachma and do their own dealings beginning with political corruptness ! Why is then there an European Parliament ? , simply because the unelected European Commission needed a veneer of democracy and the rubber-stamping EP is it. The world traded for millennia before the pointless EU was invented and will do so long after it is dead. The problem with TTIP is that it is not simply a free trade agreement between EU and the US . The US wants to retain all the legal rights to trade disputes to be held in the US . TTIP opens doors to GM foodstuffs and companies like Monsanto . The US has a flood of entertainments to fill all TV channels , that are of poor quality , contrary to European culture and languages , that could endanger the production of individual national programmes . I see it also as a tighter mesh to further ensnare Europe to US control . Trade with the US should be left to individual countries , to tailor-make an agreement that suits both parties . I know , for instance that France does not want US programmes in English language , in order to protect the use of French . Giorgos Stathakis is one of those opportunist ‘bought’ Syriza right-wingers who now just kiss the behind of the EU bureaucrats. TTIP is important for the US and large corporations to reverse all the good social programs the EU presently has and it is only those agents of the banks and large corporations who have anything to gain from it. Giorgos Stathakis is one of those who will be remembered as the losers who sold out their prinicpals to those with money. Greeks do not forget this and will vote against TTIP. You would think the Greek have other problems to focus on. Like for instance the economy and nepotism and corruption and tax evading. I don’t want to hear from them until they have paid our money back. And that should be a law in the EU. Shut up until your debt is paid! They are right as then it should be out in the open unlike the secrecy surrounding it left to the EU mandarins and unelected rulers. At least then we have democracy brought back into the situation and where this has been crushed to date by the EU. For it is like getting blood out of a stone to allow the people to have the information that they need.